Barrier effects of Large-scale Transportation Infrastructures (LTIs) are among the main factors contributing to the fragmentation of habitats. The reduction of dispersal across LTIs can drive small, local populations to extinction. To understand how LTIs modify dispersal, efficient and workable evaluation methods are required. We developed a method based on Mark-Release-Recapture surveys to estimate barrier effects of LTIs that could be easily applied in various landscape contexts and on any mobile species. Our method uses dispersal kernels of animal movements to calculate an expected probability of crossing any particular linear feature. This probability is then compared to observed crossing events to estimate the barrier effect. We used simulations to test the reliability of our method and applied this framework on the butterfly Maniola jurtina in a landscape fragmented by a motorway and a railway. Simulations showed that our method was able to detect efficiently even weak barrier effects given that enough data are available. When sample size was reduced, our method was able to detect barrier effects only when the infrastructure width was small in comparison to the average movement capacity of organisms. In our case study, both infrastructures acted as significant barriers. The power of our method is to use MRR data which are more representative of population processes than telemetry monitoring and are not limited by time-lag involved in genetic studies. This framework is of particular interest for conservation studies in order to assess how individual movements are modified by linear infrastructures. 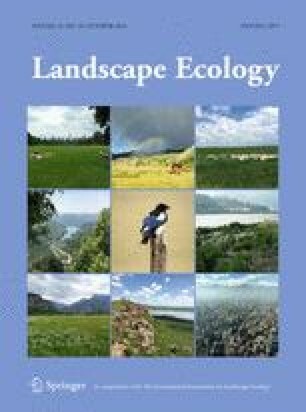 The online version of this article (doi: https://doi.org/10.1007/s10980-018-0694-0) contains supplementary material, which is available to authorized users. We gratefully thank E. Languille, A. Dubois, T. Langer, A. Mira, E. Garcia, R. Roudier, A. Bideau, A. Brisaud and J. Cornuau for their help in fieldwork. We thank J-F Arnoldi for constructive advice and comments about the framework. A. Verzeni provided helpful revisions on early versions of the draft. This study was granted by the French Ministry of Ecology, Sustainable Development and Energy (CIL&B-ITTECOP-FRB Program). Butterfly empirical data (motorway.csv and railway.csv) and R-scipts are uploaded as online supporting information. We provided a standalone R function (NEFbarrDetect.R) that estimate the barrier effect of any linear feature based on our method. Supplementary material (Appendix 1 and 2) is uploaded as online supporting information. JR, EC, SM and MB contributed to the conception and design of the study. EC and JR collected the data. EC, JR and JGP performed data analysis. JGP designed the simulation study, ran simulations and analysed simulated data. JR wrote the manuscript. All authors participated in critical revisions of the manuscript.